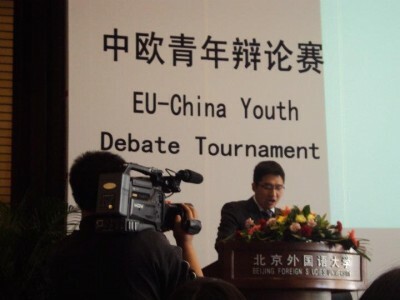 China und die Große Mauer – was genau Leonhard Weese damit meint, könnt Ihr in seinem Bericht über das EU-China Youth Debate Tournament nachlesen. 16 Teams aus der Volksrepublik und 16 Teams aus Europa nahmen daran teil. Der Bericht ist ursprünglich auf der Internetseite des Debattierklub Wien erschienen. In simplified Chinese, the set of letters so strongly supported to replace a much more complex set of characters, the word China is written as 中国. The first sign meaning center, the second meaning country. The second character looks like the sign 王, meaning monarch (and also one of the most common last names), but can be also used to describe something precious, like a crown, that is sheltered by a wall. The translation of China being “The Middle Kingdom” or “Das Reich der Mitte” is an old one, but the introduction of the simplified characters started in 1952 by Mao Zedong that taught millions of people to read and write gave a simple explanation for China’s policies at that time: China is a valuable gem that needs to be protected by a wall and sheltered from malicious influences that come from outside. Soon, China may need a new set of characters to describe itself, because the country is opening up. Rapidly. While it is almost impossible in China to find Chinese born 50 year olds and still quite a challenge to be understood among a group of Ph.D. students, English is widely spoken among University students in their early twenties. And often, the English language skills of teenagers are even better. Another visible sign of China opening up is this year’s EU-China Youth Debate Tournament. Being one of many events under this year’s Chinese motto year “EU- China, Year of Youth” this one was organized by the Beijing Foreign Studies University, which also celebrated its 70th anniversary during the tournament and has quite some experience in hosting Chinese debating competitions, mainly the FLTRP cup in May and this year’s Chinese nationals in June. Invited were the 16 breaking teams from the Chinese national debating tournament, coming from Universities in Beijing, Xi’an, Shanghai or other Chinese cities, and 16 teams that out-performed the teams from their country in 2011′s European Debate Championships. Then, all the debaters were randomly assigned to local debaters, forming true EU-China debate teams. Christoph Jäger formed team Green Hunter together with 王尼娜 (Wang Nina), and Leonhard Weese and 陶静 (Jing Tao) formed team We have siblings!. In respect to the many strong Chinese and European debaters that were invited, Debattierklub Wien is quite happy to announce that both teams broke to the quarter finals. Invited were teams not only from the European Union, but beyond that, sparking the debate of motion number one about who should, or should not be part of a EU and furthermore a EU-China Debate Competition. The tournament itself and the surrounding events were truly a fantastic experience for everyone. A full day of sightseeing, Peking Duck and other specialties served, comfortable hotel rooms, an inter cultural night, four rounds on two days and break to quarters, entry to the truly inspiring 70th anniversary celebration of the University, a three-hour spectacle of lights, music, dance and choreography (and a few Chinese celebrities! ), being able to take part and watch a recording of CCTV’s English show “Global Debate” and the ever available support from the big organizing committee made it not only a great debating experience, but also the best possible cultural experience. Being teamed up with someone you have never met can be quite a challenge, but much more it is the greatest possibility to get to know the people’s mind set, their knowledge and their debate style. It is therefore surely the best available option to get to know the country, and for the Chinese to get to know us. The vast majority of the Chinese debaters are very much like us. Although that sounds incredibly dull as a realization, it was for most of us the biggest surprise. Chinese debaters are free minded, have an extended knowledge about their country and the world, don’t hesitate to express themselves and comment, are patriotic and strive to see the world. The vast majority of the European debaters are very much like them. Being much more then the conclusion of above statement, it was for most of the Chinese the biggest surprise. We criticize our democratic systems, don’t let an opportunity pass to point out flaws, corruption, wrong doing and criminal intent in our governments (did someone say Austria?) are amazed by China’s rising economic strength and its long peaceful history. Most of us don’t see China’s rise as a threat and are simply fascinated by the rich culture and traditions of China, but also a little alienated by the personality cult around chairman Mao, the restricted use of the internet and the ever apparent income inequality. As most of the debate motions require the understanding of either a Chinese or a European concept, there was a need to explain these concepts to our debate partners. Understandably, preparation time was extended to 20 minutes. Because of that, and the amount of time debaters got to spend together after the rounds asking follow-up questions, it was that most of us learned more about China in one week than we had learned in our life time before. The Chinese middle class as well as Chinese Universities seem to enjoy large quantities of freedoms and autonomy. As China is opening up, so are the Universities and the people. Imported products are widely available, and thanks to a lack of VAT often cheaper than in their home countries. As technology gets cheaper every day, so do the opportunities to climb the Great Firewall and get a great view of the world’s and China’s problems and opinions. And since Chinese students are now able to communicate with their international peers, they know where to look. And when seeing China’s success, and the greatness of this debating tournament one might conclude that this is not so much without the knowledge or against the will of the Communist Party after all. Round 1: This house believes that EU membership should not be determined on the basis of geographical criteria. Round 2: This house believes that media company owners have the right to influence the anture of news coverage. Round 3: This house believes that China should abolish the Gaokao in favor of allowing the universities to establish their own criteria. Round 4: This house believes that it is legitimate to shut down social media like Facebook or Twitter during riots. Quarters: This house believes that a Chinese Marshall Plan should be initiated in order to save the Euro. Semis: This house would demand international corporations operating in China to uphold the same environmental standards required in their home country. The tournament was won by Yiming Zhang from Fudan University, Shanghai and Manos Moschopoulos, University of Athens (Closing Opposition). According to Chinese debate traditions, the second place at the final was awarded the Runner Up distinction, from Opening Proposition. The distinguished European speakers at the tournament were Scott Ralston, James Hardy, Manos Moschopoulos and Jeroen Heun. The three honored Chinese speaker were 潘向雪 (Pan Xiangxue), 朱杨博 (Zhu Yangbo) and 温超影 (Wen Chaoying).